BBC NEWS | UK | Leeds asks: What made them do it? Leeds asks: What made them do it? There is fear on the streets of Leeds - but perhaps more than anything there is shock that some of its young men are suspected of being the first suicide bombers to carry out their attack on British soil. But what makes young men from Leeds become so radicalised? Councillor Mohammed Iqbal is among those who has spent 24 hours trying to work that out. As soon as police raided two homes in the heart of his ward, he cleared his diary, preparing for the fall-out. The last 24 hours has seen him join other community leaders, from all backgrounds, in trying to work out why four British men would turn themselves into bombs. But asked why they did it, he pauses and says: "I wish I knew." "There are young people from all backgrounds and communities who are looking for reasons to do something wrong because they have nothing else to do," he says. "This is one of the most deprived areas of the country, there are many, many problems with jobs, education and so on. On top of that, there is to some extent a gap between the generations. But whatever the reasons, it's a disaster for this city and a disaster for community relations. "We as a Muslim community need to take a role in dealing with this. And that means the community should come forward and do its part, for the sake of everyone." This is the view that echoes around the city - although what to actually do is the hardest part. 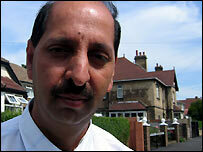 Many of Leeds' taxi drivers hail from the city's various Muslim communities - and the bombings are the talk of the cab. One man said he feared for his family's safety. Another said he was proud to have brought up his children as "British first and everything else second". Much of what's flying around however is rumour and speculation. 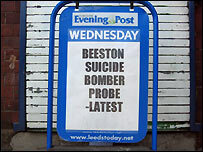 In Beeston itself tension is high, the air full of talk of fanatics, suicide bombers and an on-going threat to British society. Cllr Iqbal: "Disaster for community relations"
No young people on Wednesday were prepared to be photographed. Many were furious at the presence of reporters on their streets (one national newspaper sent 16 reporters) - and few held back with the vitriol when approached. One young man working in a corner shop close to the raided properties said he knew two of the four suspects well. Nothing he had seen had however prepared him for what they had apparently done, he said. But the young man, wearing traditional Pakistani dress and a beard, stressed that one problem had to be addressed: Muslim leaders were simply not listening to the young. "Extremists don't walk into mosques and say 'Excuse me, would you like to join me in blowing up London?'. It just doesn't work that way," he said. "But there is something else that is important. The older generations and the younger ones just don't talk like you think they should. "There's a language barrier - the kids speaking English, the elders not - and then there are huge cultural barriers. Some of the kids won't talk to the elders, they think it's too difficult." One south Leeds youth worker told the BBC that the reasons for alienation were more complex still. He said that among all the communities he worked, he had experienced a growing "victim culture" among some Muslim men - a culture linked to an international Islamic political scene that emphasises the suffering of Palestinians, Kashmiris and so on. This was something he also felt far-right activists were capable of exploiting and upping the ante, although their presence was limited. "We're all shocked by what's happened - but a lot of us are perhaps, on balance, not surprised." But all of these theories only go so far in explaining what has happened. There are gaps - and one of the key issues is what role did trips to Pakistan play in the suicide bombers' development. Shehzad Tanweer recently studied religion in Pakistan. In Muslim communities, it's not unusual for a young man or woman to spend some time abroad, particularly doing charity work in similar ways to white Brits go on a gap year backpacking experience. 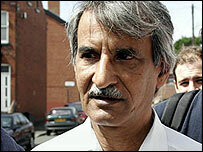 But for some Beeston people, the Pakistan trip is the key to working out "who got at the boys". "I took my kids to Pakistan to give them a sense of their heritage - and they were really shocked by the poverty," said one shopkeeper. "It really had an effect on them. Now they put aside some of the money they might spend on shoes to go to charities back there. "Now these are kids - impressionable, just as we all were in our time. It wouldn't take much for someone with bad intent to twist the minds of young men who have been to some of the poorest areas on earth and convince them that they must act in a certain way."